A lovingly restored original Manor Farmhouse in the quiet sheltered heart of the historic Bonython Estate. Furnishings are modern and tasteful and luxury equipment enables guests sharing to enjoy considerable comfort. 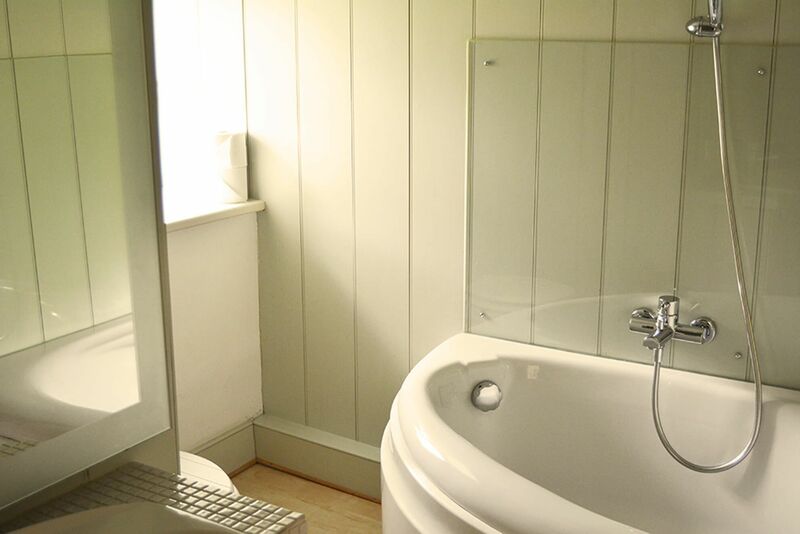 There are five bedrooms including one on the ground floor, each with its own bath or shower room. 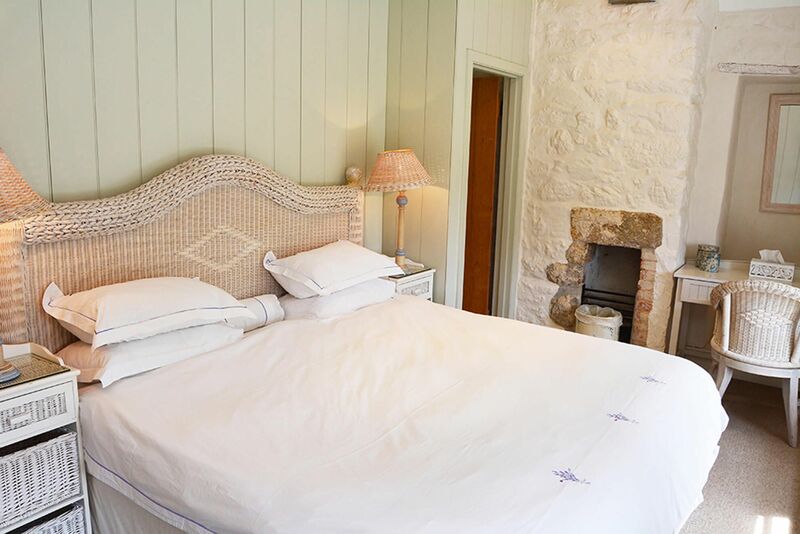 Beds are equipped with high-quality cotton sheets and duvets. Short breaks of 3 nights are available. 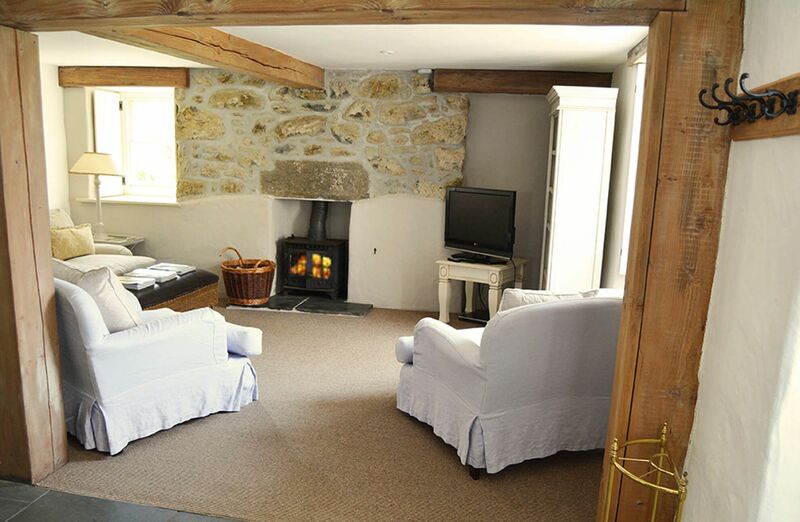 The cosy accommodation provides the ideal setting for Autumn and Winter breaks with wood burning stoves in both living rooms and comfortable beds. Surrounded by an acre of private gardens with far-reaching views, and an outdoor terrace ideal for alfresco dining. The tranquillity of the beautiful and renowned Bonython Estate Gardens are available for guests to enjoy beyond the grounds of the farmhouse. 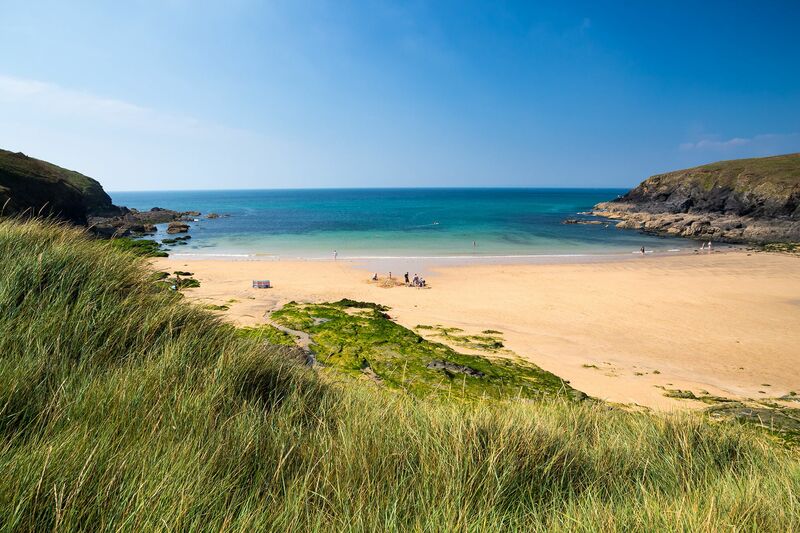 The proximity of several typically Cornish coves, beaches, cliff top walks and fishing villages are a great draw for those who want to explore further. 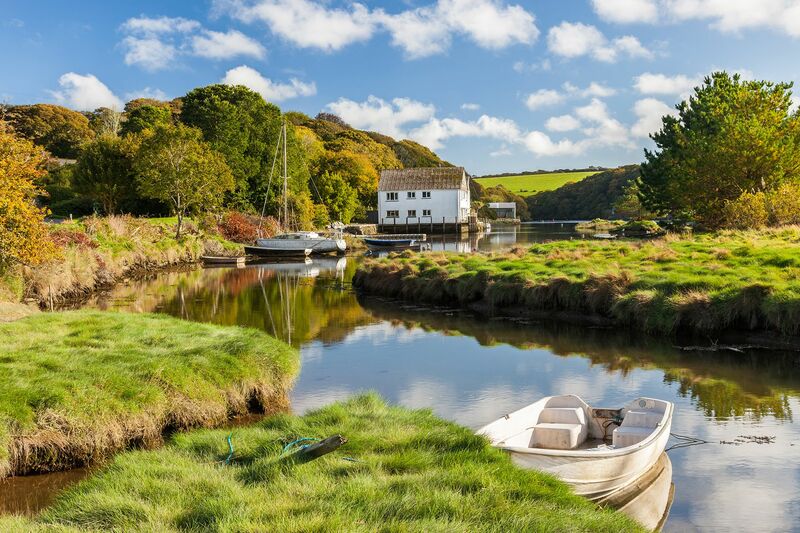 Though many parts are now rightly famous – Southern Cornwall retains quiet places, even in the height of summer. 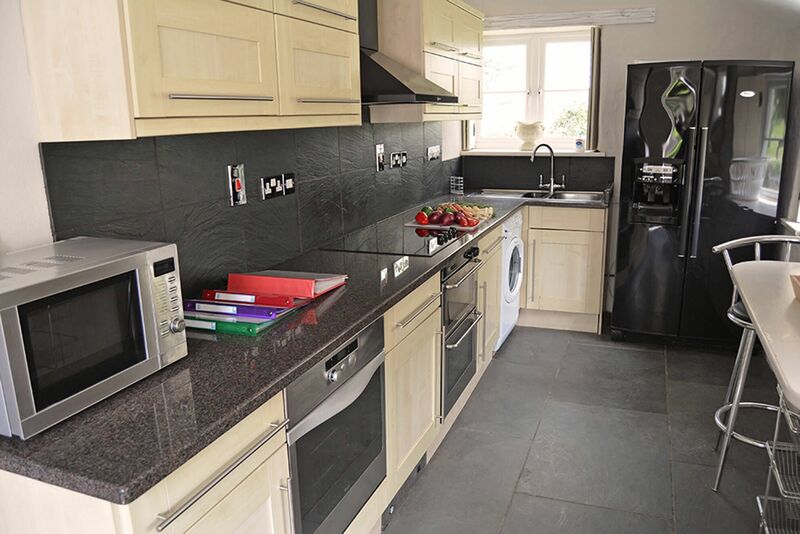 Close to shops and amenities in the small towns and villages nearby. The Wheel Inn is within a 10 minute walk. All the Poldark locations are easy day trips from Bonython. Family room with a flat screen TV and wood burning stove. Elegant dining room with original fireplace. Sunny garden room with comfortable seating. 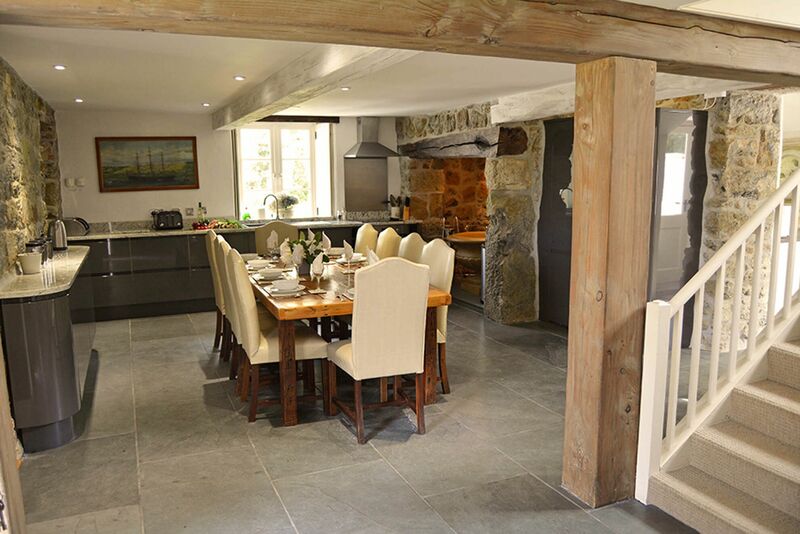 Farmhouse kitchen with breakfast bar. Outside laundry room and boot store for wet clothing and muddy shoes. 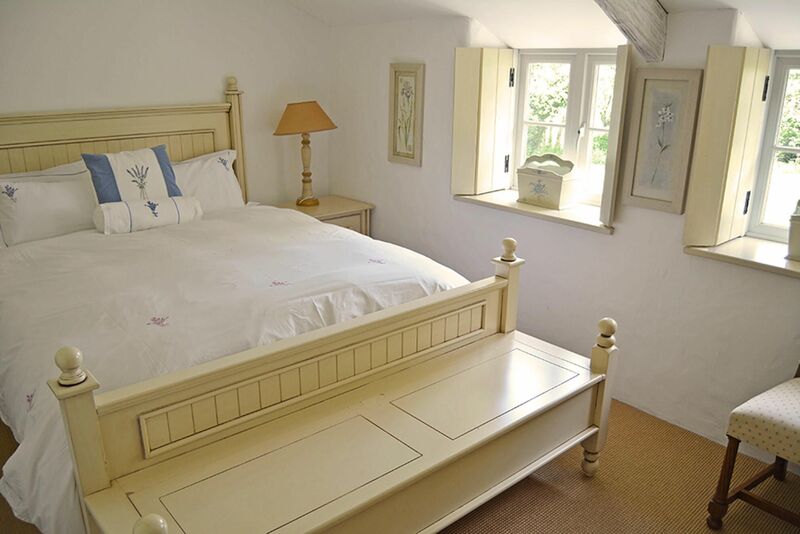 Large bedroom with super-king size bed and en suite shower room. Master bedroom with super-king size beds and vaulted ceilings open to the ancient rafters. 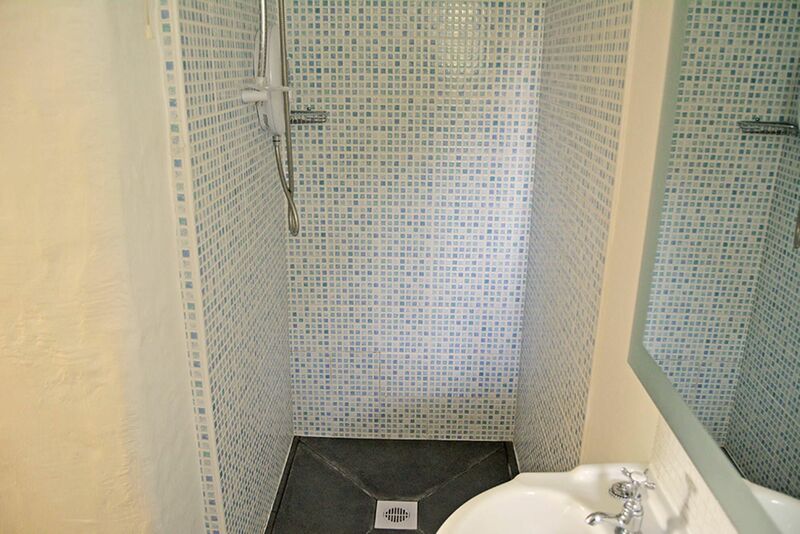 En suite shower room. 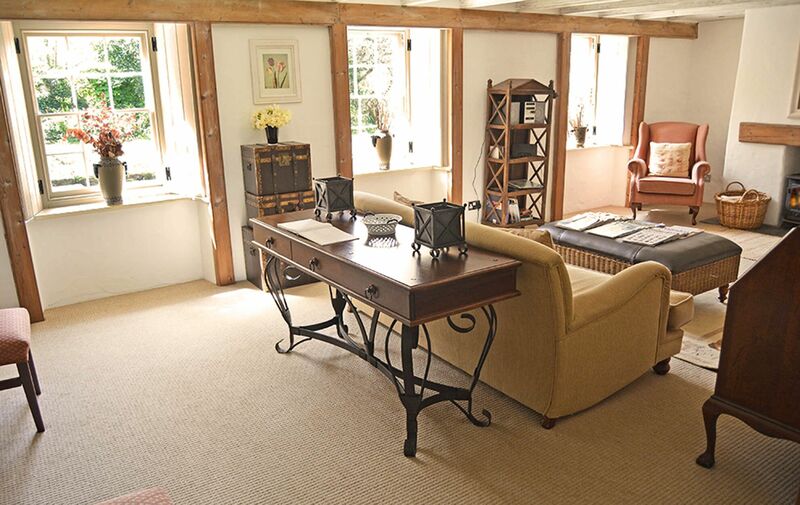 Double bedroom with super-king size beds and vaulted ceilings open to the ancient rafters. 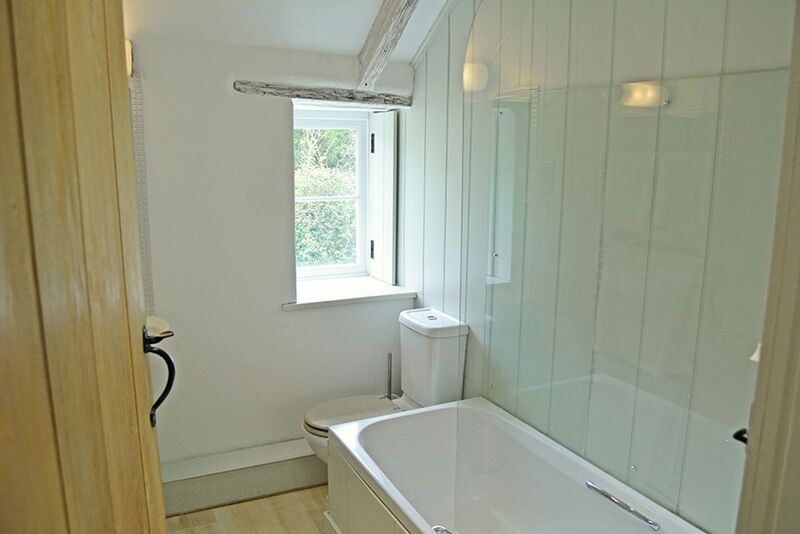 En suite bathroom with shower over the bath. 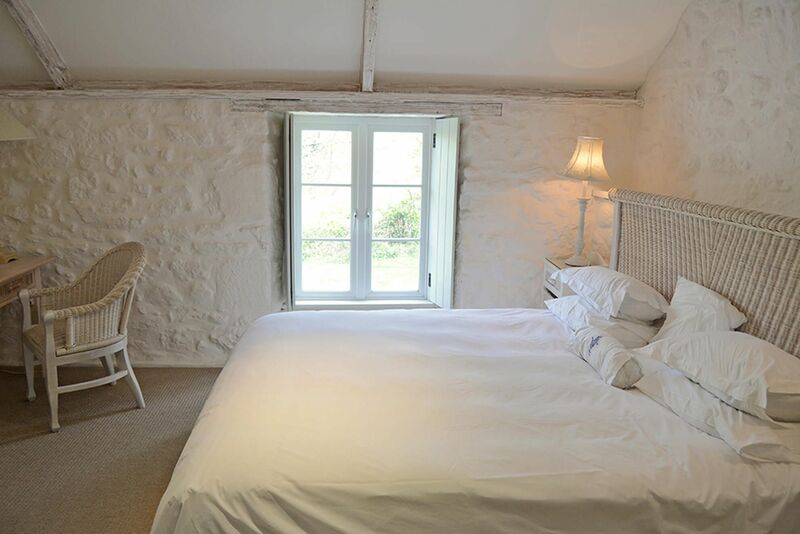 Double bedroom with super-king size bed and vaulted ceiling open to the ancient rafters. 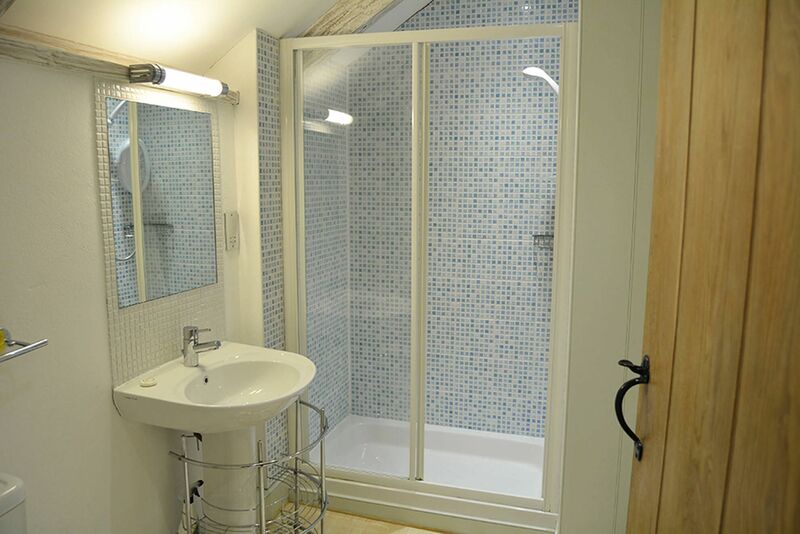 En suite shower room. 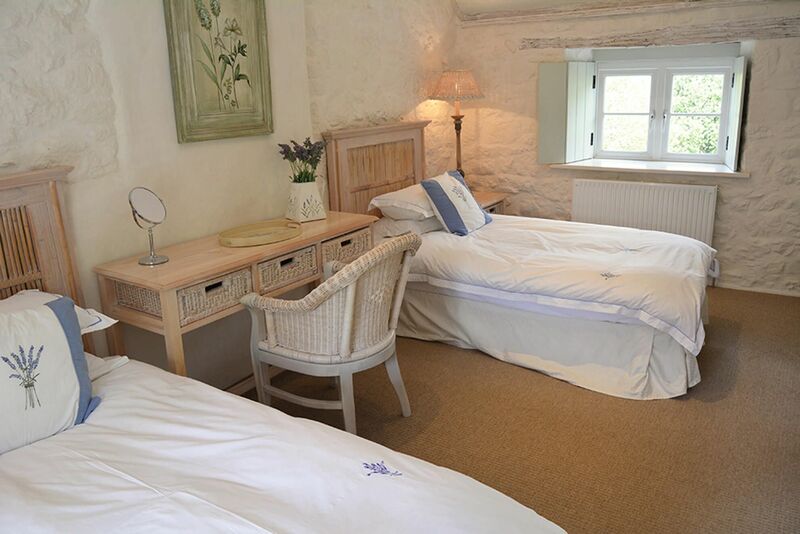 Twin bedroom with 3' beds with vaulted ceiling open to the ancient rafters. 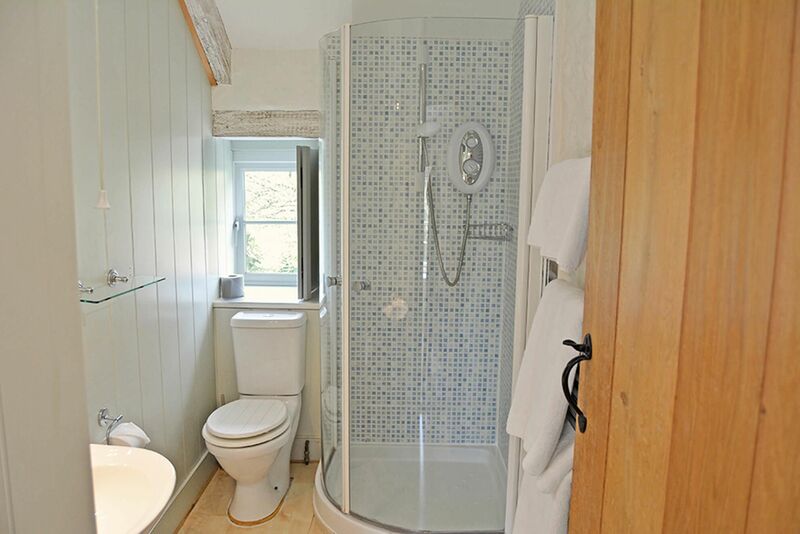 Adjoining bathroom with shower over the bath. 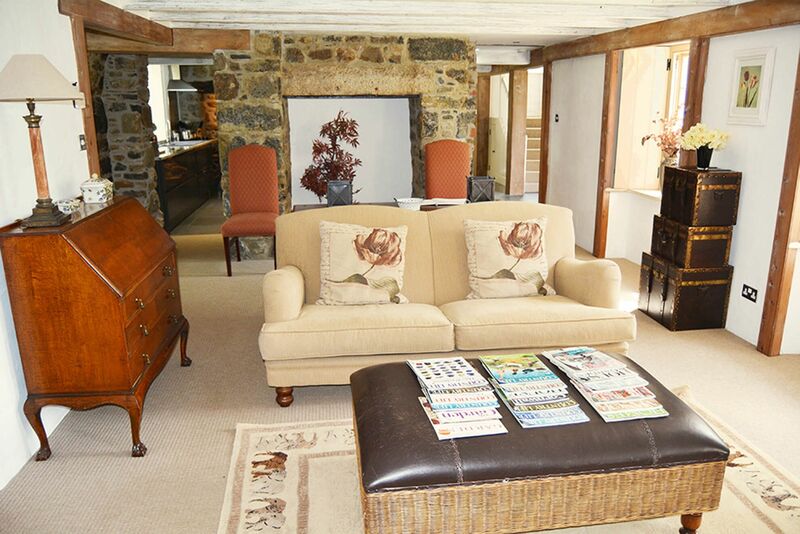 Bonython Farmhouse is a wonderful place for a get-together – and to get-away. 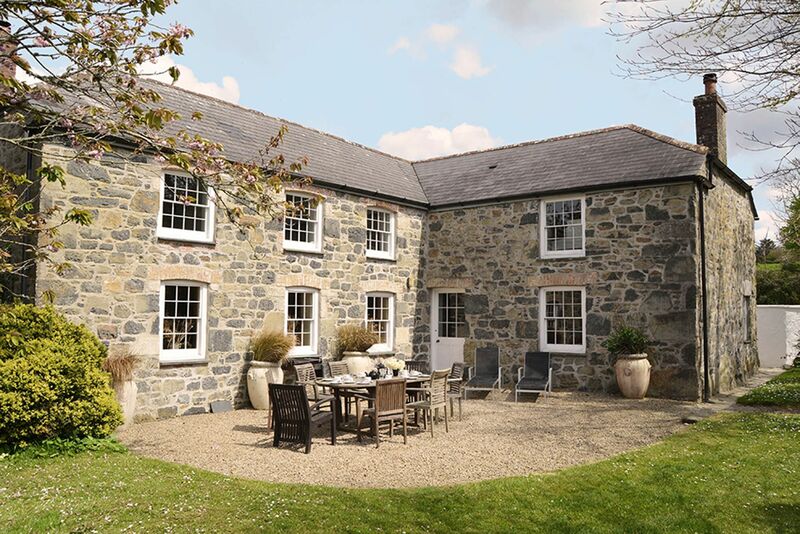 Sleeping 10 in five en suite bedrooms, the lovingly restored farmhouse is situated in an enviable sheltered location in the heart of the magnificent Bonython Estate on Cornwall's Lizard Peninsula. 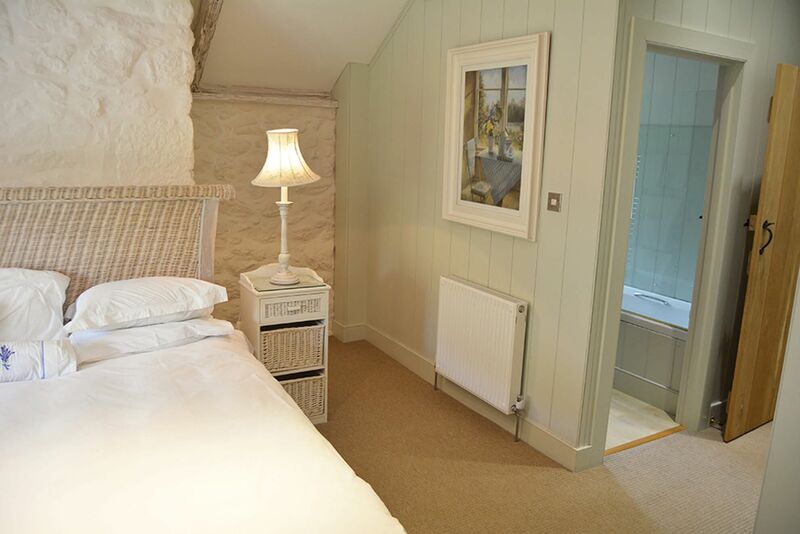 The farmhouse is beautifully furnished, and has been awarded a 5-star rating by the Cornish Tourist Board. 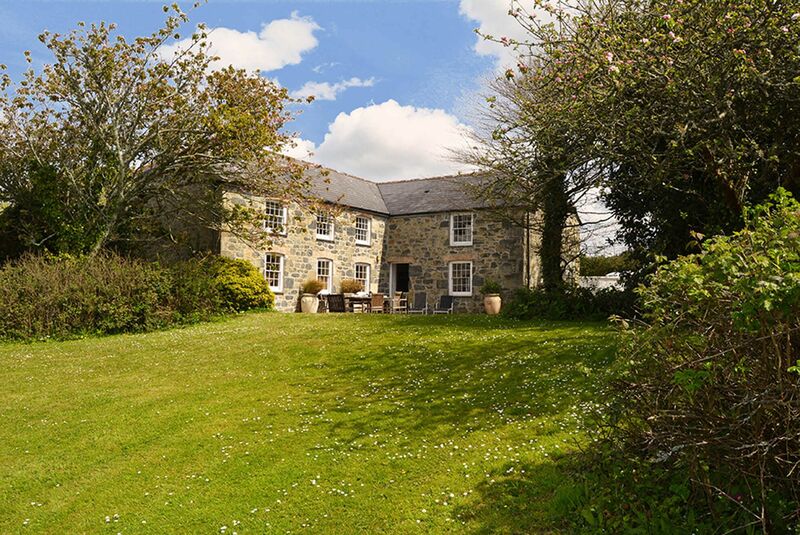 Situated six miles south of Helston, the historic country estate is close to the magnificent beaches and coves of The Lizard Peninsula. Eight minutes drive brings you down to Poldhu Cove and the wonderful coastal paths. 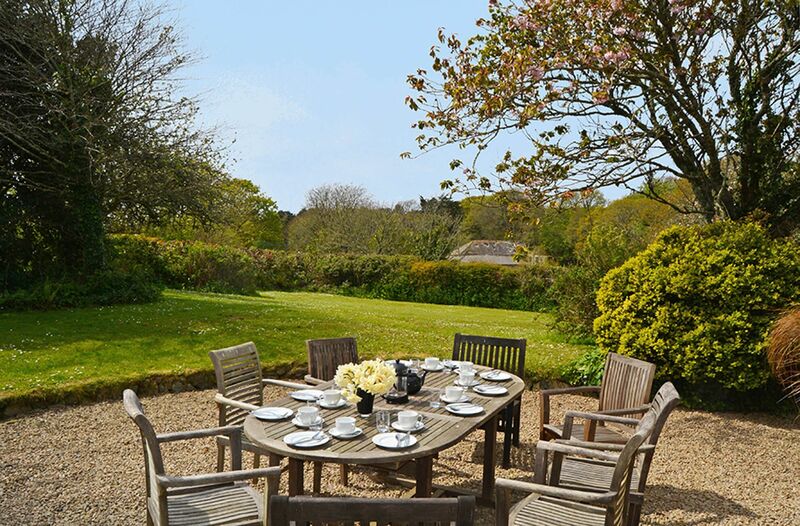 The beautifully appointed farmhouse has a sunny barbecue terrace, perfect for al fresco dining and soaking up the sun. Surrounded by an acre of private gardens with far-reaching countryside views, ancient walls and hedgerows offer complete privacy. Whether for playing, barbecuing or simply relaxing, there is plenty of room for everyone to find their own space. 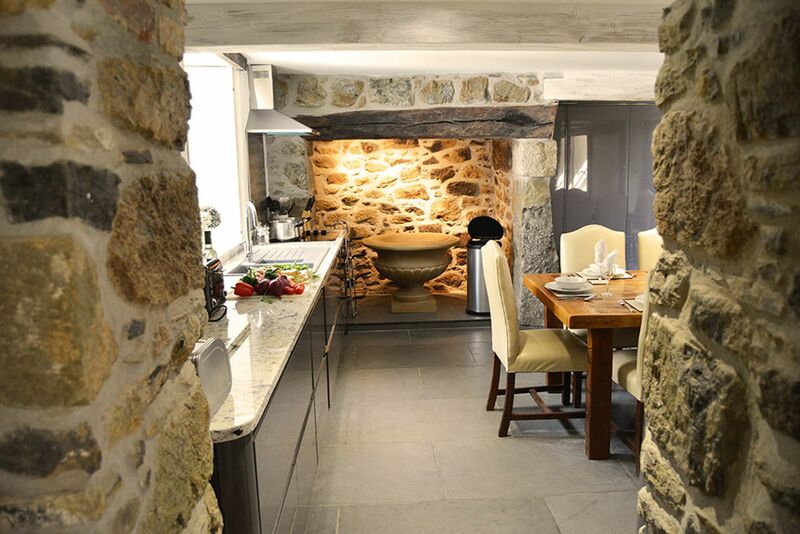 Full of rustic charm, yet bursting with modern touches, Bonython Farmhouse has grown and adapted over centuries and retains a special timeless quality. 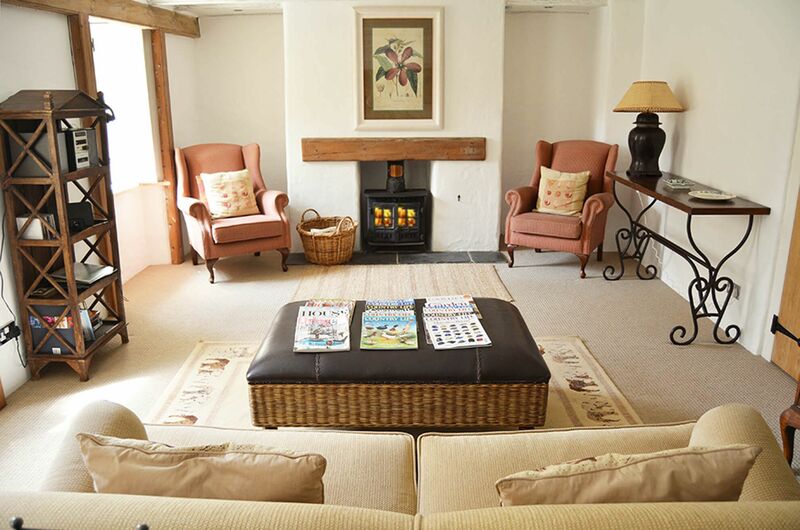 The light and homely living areas provide ample space for all the family to enjoy some downtime. 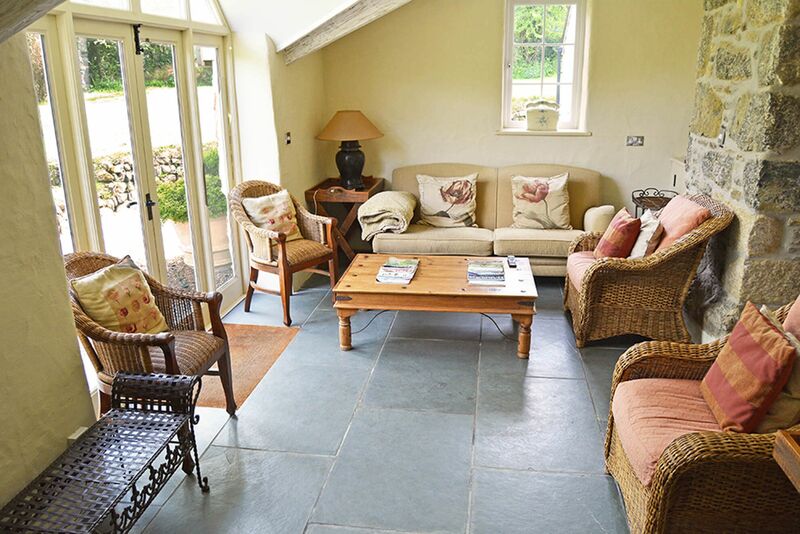 There's a spacious sitting room and family room, both with wood burning stoves, an elegant dining room, sunny garden room and country-chic kitchen. 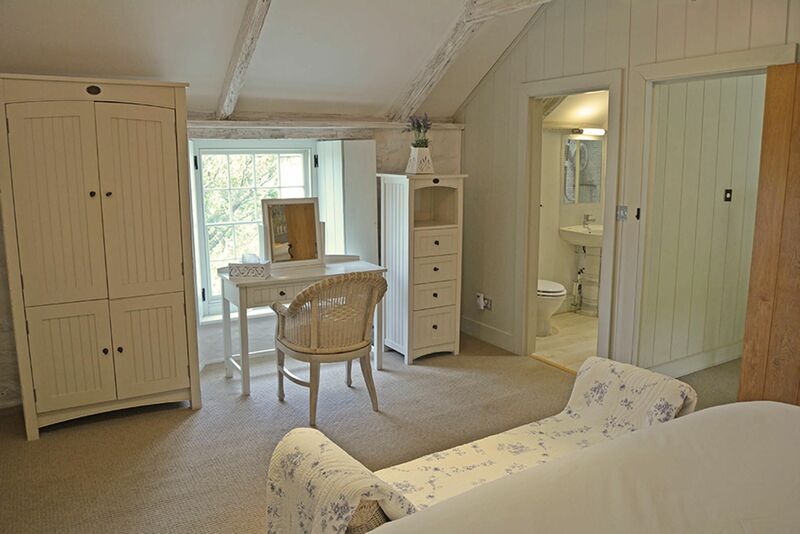 There are five bedrooms - four upstairs and one on the ground floor, each with its own bath or shower room. 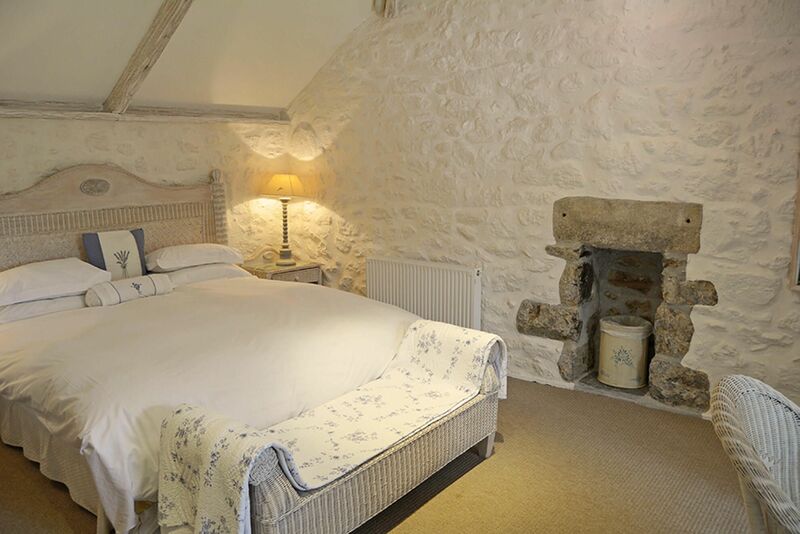 Each bedroom is light and airy with high ceilings open to the ancient rafters. 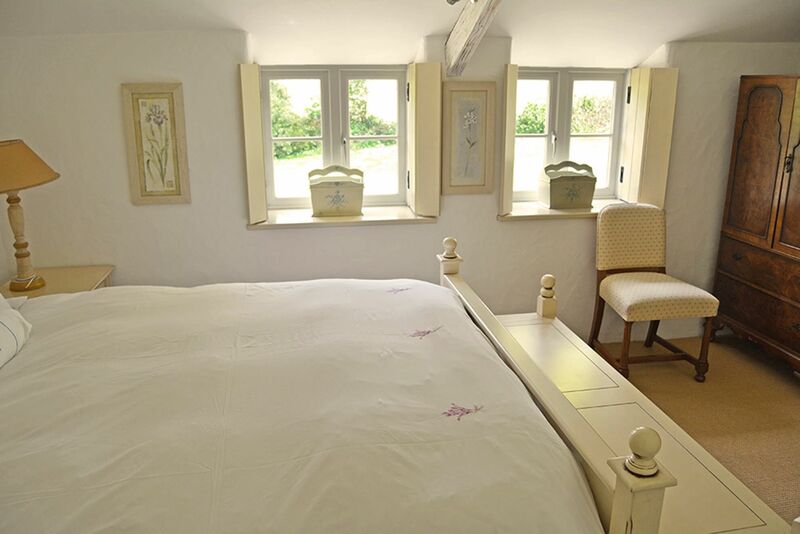 Equipped with luxurious linen, cotton sheets and duvets - choose any room and enjoy delicious dreams. Whilst privacy, peace and seclusion are the hallmark of Bonython Farmhouse, the renowned twenty acre Bonython Estate Gardens are there for guests to enjoy whenever they choose. 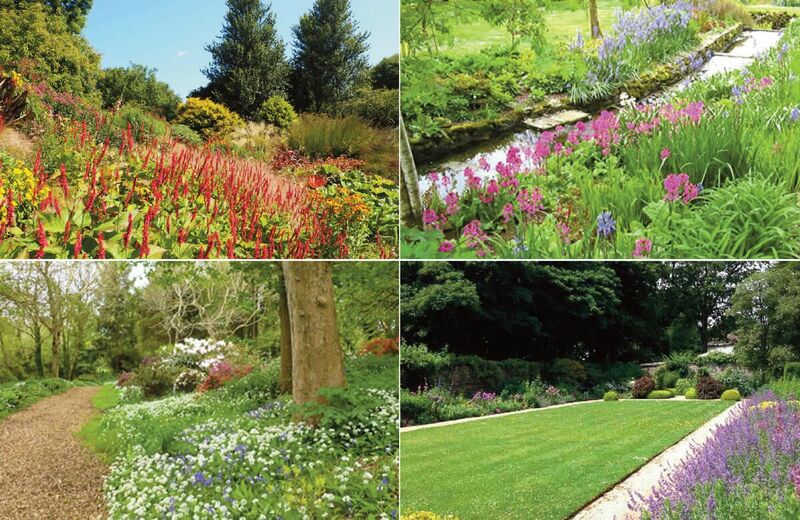 Rated as one of the 'Great Gardens of Cornwall', the gardens comprise 20 acres and offer excitement and surprises, with colour and interest in all seasons. Remodelled in recent years to include a contemporary water feature behind the delightful Georgian house, stroll through an eighteenth century Walled Garden, a traditional Potager Garden and an orchard of Cornish variety apple trees, on through parkland to a series of three small lakes, each with different atmosphere and planting with a stream cascade in a sheltered valley. 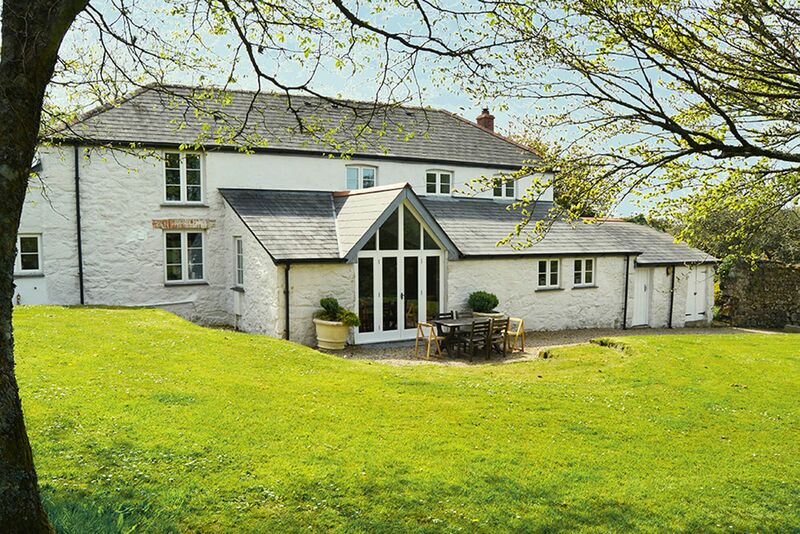 Bonython is a traditional, mixed agricultural Cornish estate with the 18th century Manor, farm and woodland stretching almost from one side of the peninsula (the Helford River) to the other (the beach at Poldhu Cove) with each shore just over a mile away. 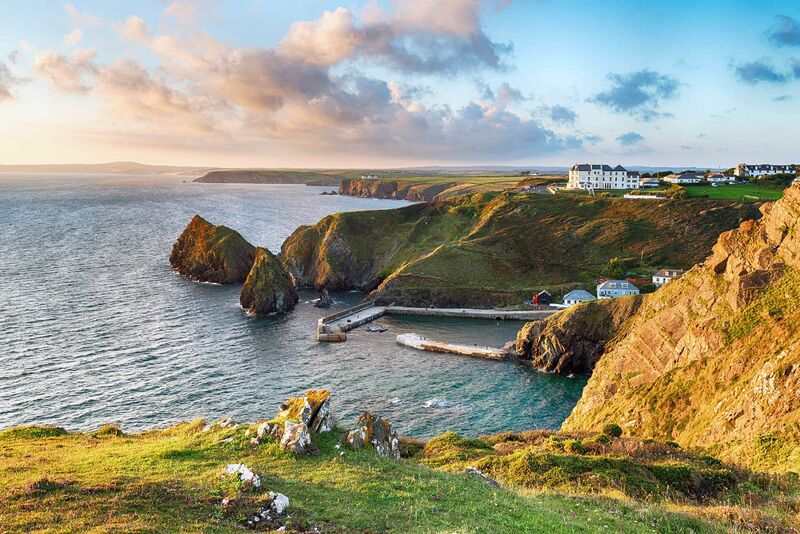 For those who want to explore further, the magic of The Lizard Peninsula is close by with world-renowned beaches such as Kynance Cove and Kennack Sands, coastal paths, historic coves and numerous fishing villages such as Mullion, Coverack and Cadgwith. 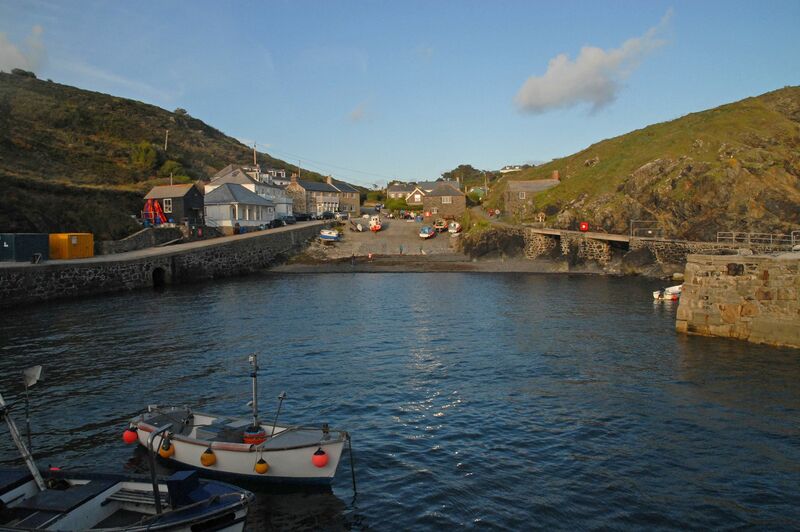 Mullion (2 miles), the largest village on the Lizard, is famous for Cornish crab and lobsters. Its many amenities include shops, convenience stores, inns, cafes and restaurants, craft shops and art galleries. Bonython Farmhouse is one of four exquisite holiday cottages set in the tranquillity and seclusion of the magnificent Bonython Estate. 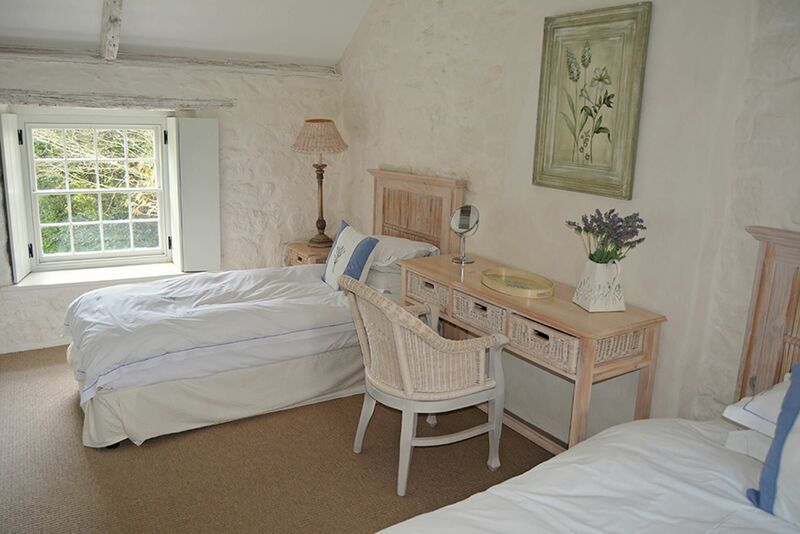 The other three properties are St Corantyn Cottage (sleeps 4), Mews Cottage and Spring Water Barn (Sleeps 2). Please check out their links for more details. With so much to see, it’s hard to do the Lizard Peninsula justice! You can click here to read our blog post ’12 great reasons to book a Lizard Peninsula holiday’ which spreads the word about this unique region. The beautiful and renowned Bonython Estate Gardens are available to guests to enjoy the tranquility beyond the cottage’s own courtyards. Poldhu Cove Beach (2.7 miles). Visit The Marconi Centre and discover the fascinating historical advances made in transatlantic radio communication. Polurrian Cove Beach (3 miles). Mullion Cove Beach (3.5 miles). Walk along the thick harbour walls dramatically surrounded by tall stacks of black volcanic rock. Gunwalloe Church Cove Beach (4.5 miles). Visit St Winwaloe Church located right on the beach, dating from the 13th century and also, due to its location, known as the Church of Storms. Scenes from ‘Poldark’ of the terrible shipwreck at night were filmed on the beach. Cadgwith Cove Beach (6 miles). Dollar Cove Beach (6 miles). Kennack Sands Beach (6.8 miles). Kynance Cove Beach (7.3 miles). Loe Bar Beach (7.7 miles). 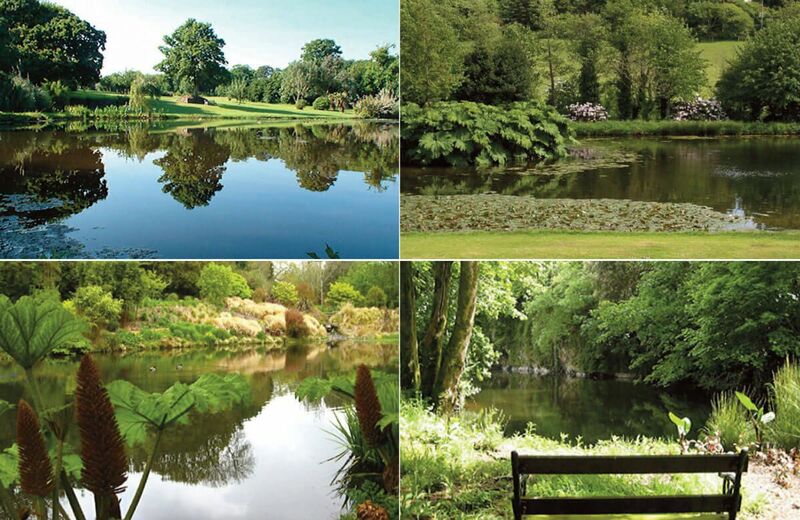 Bosahan Garden, Manaccan, Helston (6.4 miles). Trebah Garden, Mawnan Smith, Falmouth (10.7 miles). Godolphin House & Estate, The National Trust, Godolphin Cross, Helston (11 miles). Glendurgan Garden, The National Trust, Mawnan Smith, Falmouth (11 miles). Tremenheere Sculpture Gardens, Gulval, Penzance (17.2 miles). Barbara Hepworth Museum and Sculpture Garden, St Ives (19.8 miles). 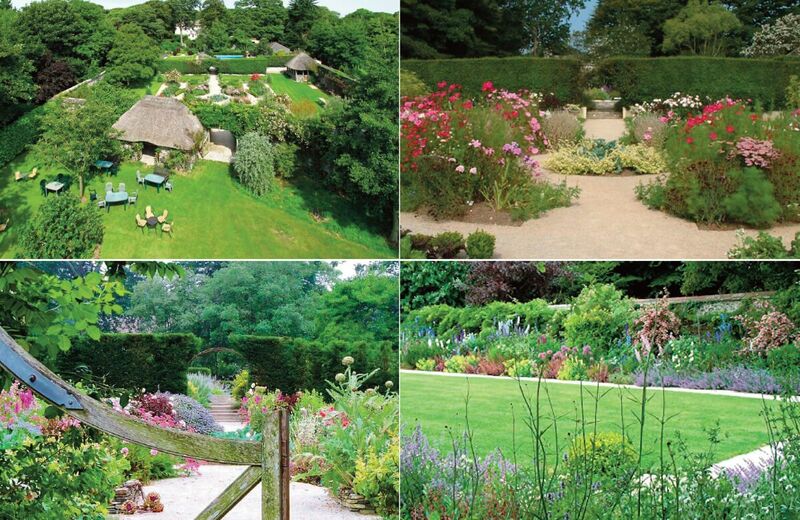 Trereife House & Gardens, Newlyn, Penzance (20.4 miles). Trengwainton Garden, The National Trust, Madron, Penzance (20.4 miles). Trelissick Gardens, The National Trust, Feock, Truro (21 miles). Trewidden Garden, Buryas Bridge, Penzance (21.2 miles). Tresco Abbey Garden, Tresco, Isles of Scilly (boat trips to the Isles of Scilly from Penzance). The Eden Project, Bodelva, St Austell (40.3 miles). MULLION (2.2 miles) is the largest village on the Lizard. A great spot for fishing with a number of boats for hire that can take you out for a few hours or an entire day. Walk along the thick harbour walls dramatically surrounded by tall stacks of black volcanic rock. Mullion is the largest village on the Lizard and has shops, convenience stores, inns, cafes and restaurants, craft shops and art galleries. GWEEK (5 miles), on the north bank of the Helford river, is a pretty village and home of the Cornish Seal Sanctuary. It has a very good Pub, The Black Swan. HELSTON (5.8 miles) is a pleasant busy market town famous for its Flora Day Festival and the many stories and legends about the “Furry Dance” are told in the fascinating Helston Folk Museum. The Blue Anchor is an historical pub in the centre of Helston dating back to the 15th century. Explore the Penrose Estate (National Trust) and take a ride on the Helston Railway. CADGWITH (6 miles) is an attractive fishing village on the Lizard with two small east-facing shingle beaches either side of a rocky promontory. LIZARD VILLAGE (6.2 miles), situated on the most southerly point of England, has an old Lifeboat Station, Lizard Lighthouse and lovely walks to Kynance Cove or Cadgwith and pretty Landewednack Church Cove. HELFORD (6.4 miles) is a pretty village nestled around the creek. A foot ferry takes passengers to the delightful gardens of Trebah and Glendurgan. Hire a motor or sailing boat and explore the still meandering creeks and inlets of the Helfords waters. There are beautiful walks up river to Frenchman’s Creek. COVERACK (7.4 miles) is a picturesque Cornish fishing village with a small sand and pebble beach on the eastern coast of the Lizard peninsula. ST KEVERNE village (7.6 miles) is one mile inland from the coastal path and has a beautiful church, whitewashed cottages, two public houses, restaurants and shops clustered around the village square which really comes alive at the annual festivals of the Ox Roast, Carnival and Rodeo. PORTHLEVEN (7.7 miles) is one of south west Cornwall’s hidden, coastal gems. The iconic clock tower sits on the harbour entrance and the pubs, shops, cafés and restaurants, including the new Rick Stein’s, cluster around the historic inner harbour, where there is plenty of boating and marine activity. MARAZION (14.6 miles), is home to the iconic castle, St Michael’s Mount. Mounts Bay and Marazion Marsh are home to hundreds of species of wildlife. FALMOUTH (14.8 miles). Attractions include Pendennis Castle (English Heritage), the multi award winning National Maritime Museum Cornwall and the award winning Falmouth Art Gallery (free entry). Ferries criss-cross the water connecting Falmouth with the charming harbour town of St Mawes and the city of Truro. PENZANCE (19 miles) has many shops, pubs and restaurants as well as cinema, bowling and laser quest. there is easy access to the beautiful Isles of Scilly by ferry. Have a wander around Morrab Gardens near the seafront. Art galleries include Penlee House Gallery & Museum and The Exchange Gallery. ST IVES (21 miles) has a thriving art scene – the cobbled streets are filled with quirky shops, galleries and lots of fabulous restaurants. Attractions include the Barbara Hepworth Museum and Sculpture Garden and Tate St Ives. TRURO (22.6 miles). Cornwall’s one and only city, with Truro Cathedral taking centre stage. Poldark Tin Mine & Gardens, Wendron, Helston (8.5 miles). King Edward Mine Museum, Troon, Camborne (14 miles). East Pool Mine, The National Trust, Pool, Redruth (16.2 miles). Cornwall Gold – Tolgus Tin Mill, New Portreath Road, Redruth (17.4 miles). Geevor Tin Mine Museum, Pendeen (26.8 miles). Geevor tin mine is one of the largest preserved mine sites in the country and a Cornish Mining World Heritage Site. Check out our blog on Poldark filming locations, all easy day trips from Bonython. The closest, just a mile from Bonython, is Church Cove, Gunwalloe, next to Dollar Cove. Other locations include: St Breward and Charlestown to the east; Porthcothan, St Agnes Head and Wheal Coates to the north; and Botallack, Levant and Porthgwarra to the west. All the coves and beaches are quite as beautiful as they look on screen, but all are deceptive, changing from sunny, peaceful places to dreadful deathtraps for ships on a lee shore when gales howl. Bonython Manor and its estate gardens were the location for the Rosamunde Pilcher ZDF film adaptations ‘The Prime of Life’ (Blüte des Lebens), ‘Summer of Awakening’ (Sommer des Erwachens) and ‘Anwälte küsst man nicht’ (loosely ‘Lawyers Do Not Kiss You’). Rosamunde Pilcher’s name has long been synonymous for outstanding entertainment, both for her novels – which have sold over 30 million copies all over the world – and for the ZDF small-screen adaptations of her works. Some of the actors who have been at Bonython are Esther Schweins, Jan Sosniok, Hugo Egon Balder and Edmund Kente. A treehouse was built for one of the films, and retained as a feature of the garden. In Germany, Rosamunde Pilcher is a household name, because of her position in German TV ratings for over 20 years where the ZDF films of her books are watched by around six million people. The first ZDF Pilcher movie, ‘The Day of the Storm’, was screened in 1993 to over eight million viewers, and more than 100 films have been made since. Bonython has been chosen as a location for several of the films. For more information, check out our blog on Rosamunde Pilcher filming locations. Goonhilly Earth Station, Goonhilly Downs, Helston (2.9 miles). Please check the web site before your visit as the Visitor Centre may still be closed for refurbishment. Flambards, Culdrose Manor, Helston (5.5 miles). A large selection of rides and indoor attractions and exhibitions to suit everyone. Roskilly’s Farm Ice Creams, Tregellast Barton Farm, St Keverne (7.7 miles). Chysauster Ancient Village Iron Age settlement – English Heritage, New Mill, Penzance (19.6 miles). Lanyon Quoit Chambered Tomb, Madron (22 miles). The Mermaid of Zennor, Zennor (23.3 miles). Tregiffian Burial Chamber (English Heritage), near St Buryan (26 miles). Porthcurno Telegraph Museum, Porthcurno, nr Penzance (28 miles). Minack Theatre, Porthcurno (28.3 miles). 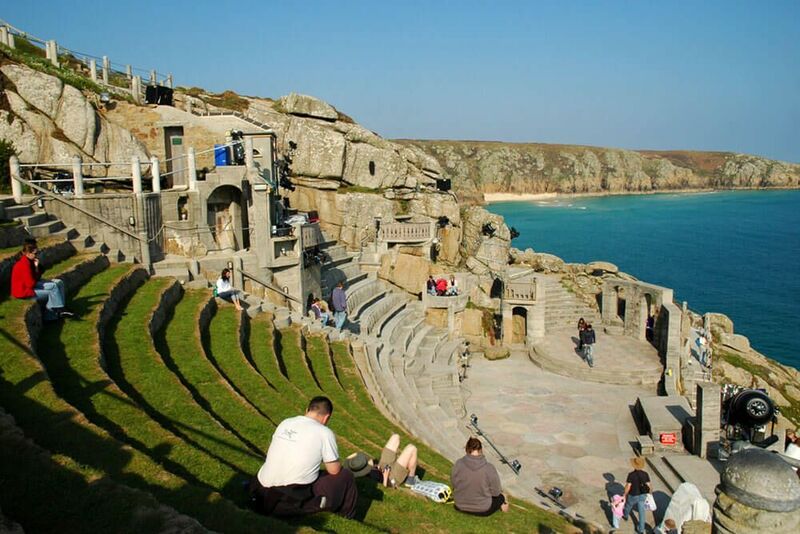 Cornwall’s world famous open-air theatre, carved into the granite cliff and set in glorious gardens overlooking the spectacular panorama of Porthcurno Bay, shows both local and national productions. 5 St Piran’s Day, Penzance (19 miles). The St Ives Feast – Hurling the Silver Ball, St Ives (21 miles). Falmouth Spring Festival, Falmouth (14.8 miles). The Truro Festival, Truro (22.6 miles). Trereife Easter Food and Craft Fair, Trereife House, Penzance (20.2 miles). Porthleven Food and Music Festival, Porthleven (7.7 miles). Trevithick Day, Camborne (14.6 miles). St Ives May Day, St Ives (21 miles). Helston Flora Day, Helston (5.8 miles). St Ives Literature Festival, St Ives (21 miles). Fal River Festival, Variety of venues around the Fal River, Falmouth, Truro, Roseland. Penzance Literary Festival, Penzance (19 miles). Falmouth International Sea Shanty Festival, Falmouth (14.8 miles). Golowan Festival, Penzance (19 miles). The two main events are Mazey Day and Quay Day. Murdoch Day, Redruth (15.5 miles). St Buryan Rally, St Buryan (24.2 miles). Marazion Carnival, Marazion (14.6 miles). St Keverne Ox Roast (7.6 miles). Usually taking place on the first Wednesday of August, the whole of the village celebrates with brass bands, entertainment, stalls, refreshments and of course an ox roast. The first slice of beef goes to the highest bidder. Falmouth Week, Falmouth (14.8 miles). Helford Passage Regatta, Helford (6.4 miles). St Ives September Festival, St Ives (21 miles). Falmouth Oyster Festival, Falmouth (14.8 miles). Montol Festival, Penzance (19 miles). Tom Bawcock’s Eve, Mousehole (23 miles).